My two boys and I went out fishing. I was mainly fishing for striped bass, and I had their poles rigged up for bluegill and crappie. The boys were using nightcrawlers under a bobber near the weed lines and in the pockets of some tully bushes, while I was soaking cut baits of sardines and fresh shad. After fishing out deep for a while without any luck, not even from any catfish or the small schoolie sized stripers, I decided to start dropping in up shallow near the shoreline. It was getting late anyway, so I figured I'd give that a shot knowing that stripers can often be found along those areas, especially during certain times. Still nothing. The fish just didn't seem to be there. Or just weren't biting. But wait, I felt a little tug on my line. Then another. I let out a little slack. I kept thinking, c'mon and take it. But nothing. I thought it was just a small curious schoolie fish or a panfish stealing my bait. I reeled in my fishing line to check my bait, and to my surprise, this little crazy looking crawdad was dangling off the end of my bait looking right at me. My kids and I couldn't help but laugh. And I thought why not use the crawfish as bait. It was getting darker and I had a hard time seeing exactly where to hook it. 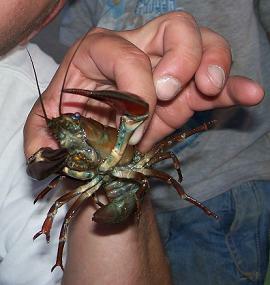 I got the crawdad on alright, so I thought, but it flew off into the deep water as soon as I made my cast. Oh well, it was time to head home anyway. Maybe next time.